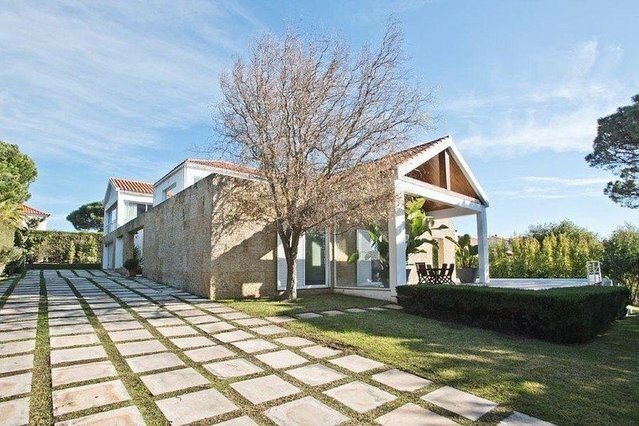 Fantastic 4 bedroom detached villa, designed by the architect Raul Vieira, in one of the most prestigious closed condominiums in Estoril with 24 hour security, green spaces and sports and leisure infrastructures. The property stands in a plot of 1,190 sqm and has a gross living area of 329 sqm. It comprises, on the ground floor: an entrance hall, a living area of 60 sqm with a high ceiling, a fireplace, a library area and with access to the garden and a swimming pool area, a dining room of 20 sqm and a guest bathroom. The service area comprises a domestic staff bedroom, a full bathroom and a kitchen of 20 sqm with a scullery and a pantry. First floor: 3 suites of 22 sqm, 19 sqm and 19 sqm, one of which has a closet and a sitting room. Lower ground floor: this has its own natural light and has an open space area of 50 sqm, a laundry room, a wine cellar and 2 storage rooms. There is a closed garage for 2 cars and outside is the swimming pool which has a large terrace with a decked area. The property has good solar orientation and a lot of privacy. It is in close proximity to the A5 motorway and shopping malls.